LOS CABLES TRIPP-LITE DE CONEXIÓN CAT5E AZULES TIENEN 2 CONECTORES MACHOS MOLDEADOS ESTÁNDARES RJ45 CON ALIVIO DE TENSIÓN INCORPORADO. EL CABLE ESTÁ FABRICADO EN PVC CON 4 PARES UTP TRENZADOS Y ESTÁ CLASIFICADO PARA COMUNICACIONES DE 350 MHZ/1 GBPS. LOS CABLES SE OFRECEN EN DIVERSAS LONGITUDES Y COLORES PARA TODAS LAS NECESIDADES DE CABLEADO DE CATEGORÍA 5 (CAT5) Y 5E. 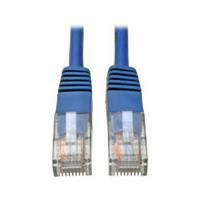 CABLES PARA APLICACIONES CAT5 Y CAT5E LONGITUD: 6 PIES (1,8 M) COLOR: AZULES RJ45 MACHO. CUENTAN CON CONECTORES MOLDEADOS Y ALIVIO DE TENSIÓN INCORPORADO. PVC: 4 PARES TRENZADOS SIN BLINDAJE (UTP). CALIFICADO PARA COMUNICACIONES DE 350 MHZ / 1 GBPS. GARANTÍA LIMITADA DE POR VIDA.